by John Oates, Analog Devices, Inc. It has been over 10 years since the smartphone revolution began, when Apple released the original iPhone® in 2007. 10 years and two generations of wireless standards later—a lot has changed. Perhaps not as glamorous as the headline grabbing consumer smartphones, known as user equipment (UE), the infrastructure base station (eNodeB) of the radio access network (RAN) has gone through its own transformation to enable the data deluge of our now ever connected world. Cellular bands have increased 10×, while data converter sample rates have increased 100×. Where does this leave us? From 2G GSM to 4G LTE, the number of cellular frequency bands has exploded 10×—from four to over 40. With LTE networks coming on the scene, base station suppliers have found themselves multiplying radio variants. LTE-advanced increased the requirements of multiband radios by adding carrier aggregation to the mix, whereby noncontiguous frequency spectrum inside the same band or more importantly, in different bands, could be aggregated in the baseband modem as a single stream. Figure 1: Carrier aggregation of noncontiguous spectrum highlights the sparse spectrum problem. In red is shown licensed spectrum bands. In green is shown the interband spacing. However, the RF spectrum is sparse. Figure 1 shows several carrier aggregated band combinations highlighting the sparse spectrum problem. In green is interband spacing and in red is the band of interest. Information theory dictates the system does not waste power converting the undesired frequency spectrum. 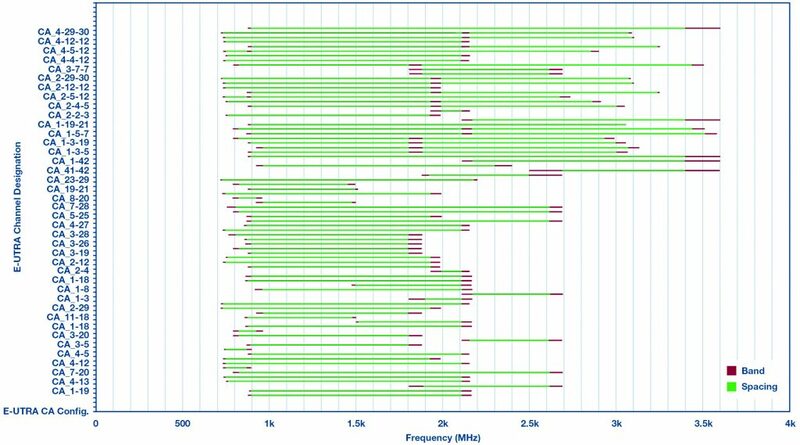 Multiband radios with an efficient means of converting sparse spectrum between analog and digital domains are needed. To facilitate the increased data consumption of 4G LTE networks, the wide area base station has undergone an evolution in radio architecture. Superheterodyne, narrow-band, IF-sampling radios with mixers and single-channel data converters have been replaced with I/Q-based architectures that double the bandwidth, such as complex-IF (CIF) and zero-IF (ZIF). ZIF and CIF transceivers require analog I/Q modulators/demodulators with dual- and quad-channel data converters. However, these wider bandwidth CIF/ZIF transceivers also suffer from LO leakage and quadrature error images that must be corrected. Fortunately, data converter sampling rates have also increased 30× to 100× in the last 10 years, from 100 MSPS in 2007 to 10 GSPS+ in 2017. This increase in sampling rate has ushered in GSPS RF converters with very wide bandwidths, enabling frequency agile software-defined radio to finally become a reality. Perhaps, the holy grail of sub-6 GHz radio BTS architecture has long been direct RF sampling and synthesis. Direct RF architectures eliminate the need for analog frequency translation devices, such as mixers, I/Q modulators, and I/Q demodulators, which themselves are the source of many unwanted spurious signals. Instead, the data converter directly interfaces with RF frequencies and any mixing can be done digitally by integrated digital up-/downconverters (DUCs/DDCs). Multiband efficiency gain comes in the form of sophisticated DSP included in ADI’s RF converters that allow digital channelization of only the desired spectrum bands while simultaneously giving access to the full RF bandwidth. Using parallel DUCs or DDCs, which combine interpolating/decimating up-/down-samplers, half-band filters, and numerically controlled oscillators (NCOs), the band(s) of interest can be digitally constructed/deconstructed before conversion between analog and digital domains. The parallel digital up-/downconverter architecture allows you to channelize multiple bands of desired spectrum (shown in red in Figure 1) and not waste valuable cycles converting unused interband spectrum (shown in green in Figure 1). Efficient multiband channelization has the effect of lowering the required sample rates of the data converters, as well as the number of serial lanes required for transport across the JESD204B data bus. Reducing system sample rates reduces the cost, power, and thermal management requirements on the baseband processor, saving CAPEX and OPEX of the total base station system. It remains true that implementing channelization DSP in a highly optimized CMOS ASIC process is far more power efficient than implementation in generalized FPGA fabric—even if the FPGA is in smaller geometries. The RF DAC has succeeded in replacing the IF DAC in these next-generation multiband BTS radios. Figure 3 shows an example direct RF transmitter with the AD9172, 16-bit, 12 GSPS RF DAC that supports tri-band channelization with three parallel DUCs, allowing flexible placement of subcarriers across 1200 MHz bandwidth. 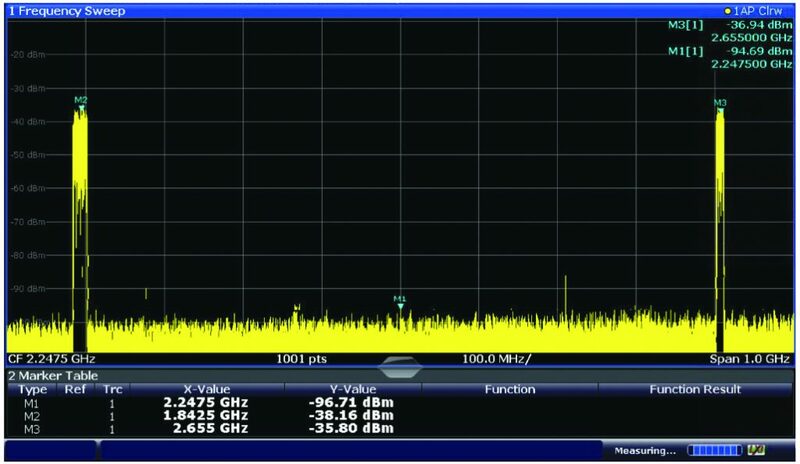 Following the RF DAC, the ADL5335 Tx VGA provides 12 dB of gain and 31.5 dB of attenuation range up to 4 GHz. The output of this DRF transmitter can then drive a power amplifier of choice depending on the output power requirements of the eNodeB. Consider the Band 3 and Band 7 scenario shown in Figure 4. Two different approaches can be employed to convert the data stream to RF directly. The first approach (a wideband approach) would synthesize the bands without channelization, requiring a data rate of 1228.8 MHz. 80% of this bandwidth yields a DPD (digital predistortion) synthesized bandwidth of 983.04 MHz, sufficient to transmit both bands and their 740 MHz of interband spacing. The advantage of this approach is for DPD systems, which allow for predistortion not only of the intraband IMDs of each individual carrier, but also other unwanted nonlinear emissions between the desired bands. The second approach is to synthesize channelized versions of these bands. Since each band is only 60 MHz and 70 MHz, respectively, and since operators will only have licenses for a subset of this bandwidth, it is not necessary to transmit everything and consequently incur high data rates. Instead let us utilize a more appropriate, lower data rate of 153.6 MHz, 80% of which results in a DPD bandwidth of 122.88 MHz. 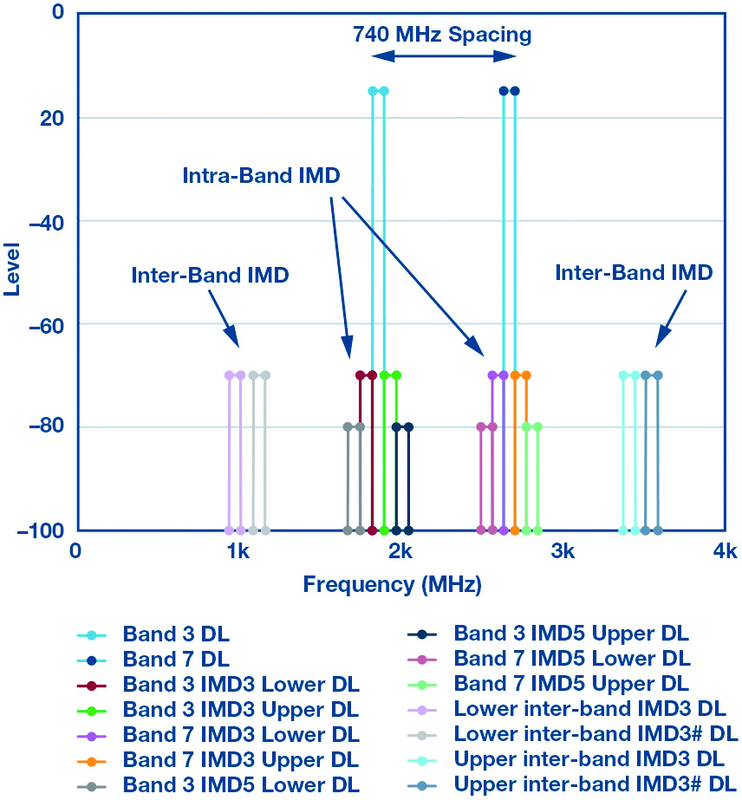 If an operator owns licenses for 20 MHz in each band, there is still enough DPD bandwidth for 5th-order correction of intraband IMDs for each band, respectively. This mode can save up to 250 mW of power in the DAC from the wideband approach above and much more power/thermal savings in the baseband processor, as well as reduce serial lane count, allowing for smaller, lower cost FPGA/ASIC implementations. Figure 3: A direct RF transmitter. RF DACS such as the AD9172 include sophisticated DSP blocks with parallel, digital upconverting channelizers to enable efficient multiband transmission. Observation receivers for DPD have also evolved to DRF (direct RF) architectures. The AD9208 14-bit, 3 GSPS RF ADC also supports multiband channelization through parallel DDCs. The combination of RF DAC and RF ADCs in the transmitter DPD subsystem has many benefits, including shared converter clocks, correlated phase noise cancellation, and overall simplification of the system. One such simplification is the ability of the AD9172 RF DAC, with its integrated PLL, to generate up to a 12 GHz clock from a low frequency reference signal, removing the need to route high frequency clocks around the radio board. Additionally, the RF DAC can output a phase coherent divided down version of its clock for the feedback ADC. Such system features truly enhance the BTS DPD system by creating an optimized multiband transmitter chipset. Ten years after the smartphone revolution, the cellular business is all about data throughput. Single band radios can no longer keep up with the capacity requirements of consumers. To increase data throughput, more spectrum bandwidth must be made accessible through carrier aggregation of multiple bands. RF data converters can access the entire sub-6 GHz cellular spectrum, being quickly reconfigured for various band combinations, making software-defined radio a reality. These frequency agile direct RF architectures reduce cost, size, weight, and power. This fact has made the RF DAC transmitter and RF ADC DPD receiver the winning architecture of choice for sub-6 GHz, multiband base stations. John Oates is a system engineer focusing on wireless base station architecture in the Communications Systems Group. Lately, his focus has been on GSPS converters for direct RF transmitters and observation. John joined ADI in 2008 and holds a B.S. in Cp.E. from North Carolina State University. He can be reached at john.oates@analog.com.